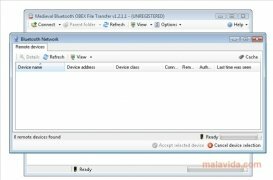 Bluetooth OBEX File Transfer is a program that is used to share files over Bluetooth devices that use the sensational OBEX protocol, download it now! Each day there are more devices that have Bluetooth. A wireless connection system thanks to which you will be able to transfer information and make mobiles, computers, headphones and other gadgets communicate with one another without any need for cables. 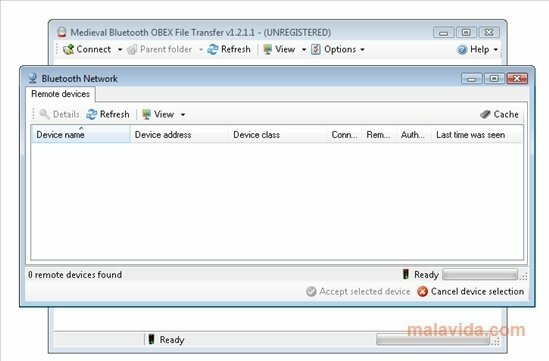 Bluetooth OBEX File Transfer is a program that makes the most of the devices that include the OBEX protocol (an advanced file transfer system over Bluetooth) and simplifies the process by means of which we can share all the information, being similar to an FTP client. The interface is rather simple and, after configuring it properly, it won't be at all complex to use. - High speed file transfers. - Support to drag and drop files. - Function to work in the background. Discover one of the most comfortable ways to be able to share information without having to use any cables, thanks to Bluetooth OBEX File Transfer. The trial version can be used a total of 10 times.